There are many famous cats whose preoccupation with food has been well documented. There’s Sylvester, who continually tries to outwit Granny and her AK-Umbrella to get to Tweety Bird, the canary-du-jour. There’s Garfield, Jim Davis’s creation, who may have single-handedly revitalized sales of frozen lasagna. There’s Tigger, who looks like he’s on a perpetual Halloween sugar high. Maybe you haven’t heard of Stubby. Stubby is the cat of author Jan Markley. Well, technically, it’s not Jan’s cat, but her niece’s cat. My niece’s cat lives with me because my nephew is allergic to cats. They found that out after Santa Claus brought Stubby the cat from some friends he knew in China (my niece’s childhood version of the story). I soon discovered that Stubby liked all human food made of wheat. You couldn’t turn your back on your bowl of chilli and bun for a minute without the cat jumping up on the table and absconding with the bun down to the furnace room. In order to ease her transition to living with me, my niece would give Stubby a variety of foods made from wheat: Cheerios, crackers and bread. 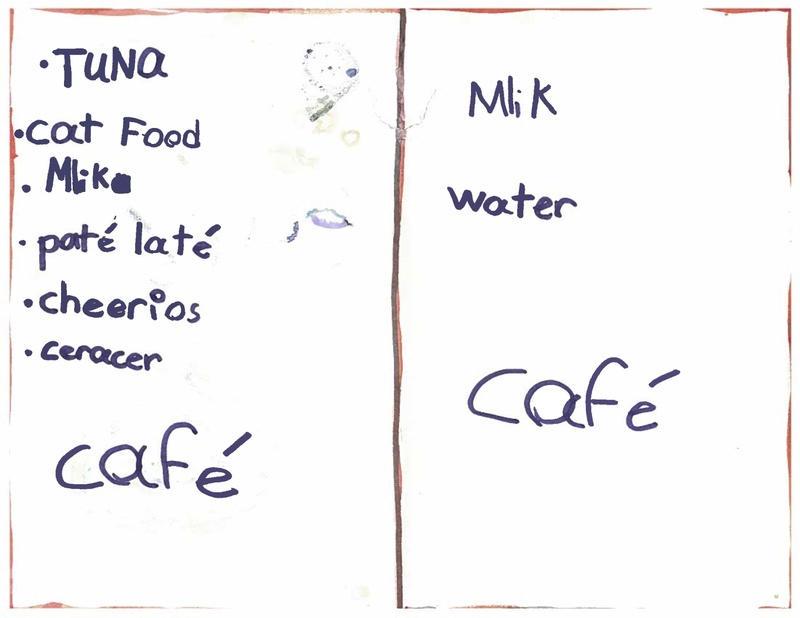 One time when my niece was five, and visiting her cat at my house, she decided to open a Cafe for her cat. Here’s the menu of many delights that a cat could enjoy. A Pate Late? Maybe Starbucks will start marketing to felines. Ceracer = Cracker. I love the use of the accents (French immersion kindergarten paid off). As writers they tell us to read everything, even menus (this is especially fun when in another country where the menu has been translated into English). Now a teenager, Teaghan isn’t writing menus for a cat cafe, but she still writes and blogs at Tiny Canadian where she shares the random rants of a tiny Canadian. And as for her aunt, she still provides for all of Stubby’s wheat needs (no gluten allergy there). Jan blogs at Three Dead Moths where she explores where writing meets life. Posted on June 6, 2011, in Miscellaneous and tagged Chase McFadden, Humor, Jan Markley, kid writing, Leanne Shirtliffe, Stuff Kids Write, Stuffkidswrite.com, Three Dead Moths, Tiny Canadian. Bookmark the permalink. 18 Comments. I hadn’t considered tuna with my Cheerios before, but I’m going to give it a shot. And use more accents. No doubt General Mills will be marketing that soon. Pate late is going to be my new curse phrase. It’s easy to sound angry when you yell in accents. Brilliant. I think I may adopt that too. And table service. Only the very best for kitty. Accent egu was always the best accent, though the cap was pretty cute, too. Great to see Stubby in all her internet glory. 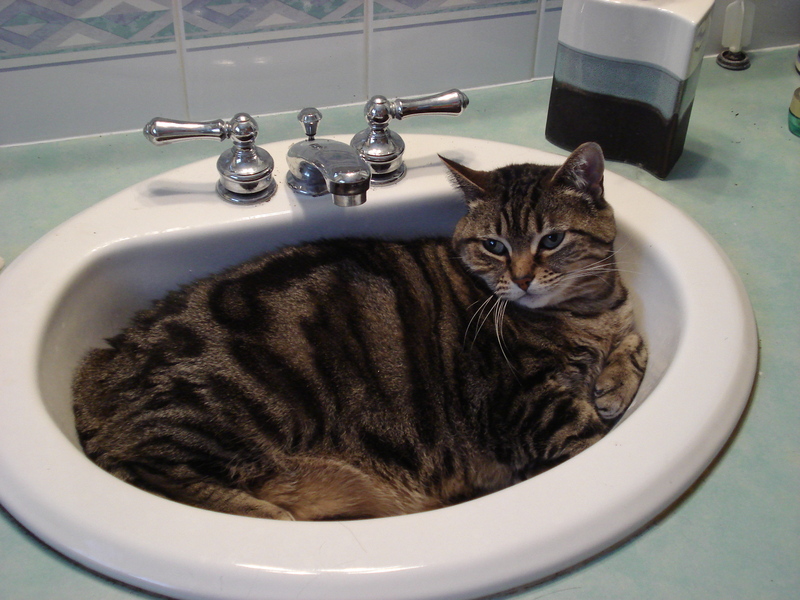 There’s actual a website called ‘cats in sinks’ maybe Stubby will show up there next! Really? Cats in sinks? Next thing you know, there’ll be a site for people in the bathtub. Seeing as I sport an “accent egout” in my name, I was immediately drawn to that paté laté – which saw my accent egout and raised it. Then L’il Miss Tiny Canadian had to up the ante even further. I might put accénts over all é’s today. In honor of Téaghan. Off to drink a cup of café. Is that how you spell the accent? The things I learn. What’s the keyboard shortcut? It’s “accent aigu”…Alt 0233 for an é.
Wow, the cat is talented: he can steal and read too! Thanks for the code, Wendé! Thanks, Cindy. I’m a bit worried “if you know what I mean” may be printed on my tombstone one day. Although, that would be rather funny…nothing like gallows humour! Thanks, Teaghan. Something tells me you’re still a genius! Off to scout it out!